FREE for Kindle Unlimited members! Young girls and boys will chuckle reading about the adventures and misadventures of a real African hippopotamus that, one day, at noon, decided to migrate south: “The moon sees all from way up high, I wish to also see the world go by." It took Hubert many years to travel 1 600km south, along the South African coast. Along the way Hubert made many friends and enemies as he was a friendly hippo but with a rather large appetite and he didn’t quite followed the human rules. Nobody knows why Hubert migrated, but we do know that he was happy when he reached his final destination and that only after his death was discovered that he was, actually, a girl. Huberta the Hippo is based on the true story of an African hippopotamus that traveled 1 600 km (1, 000 miles) along the coast of South Africa. Huberta left her waterhole in the St. Lucia Estuary in Zululand (now KwaZulu-Natal, South Africa) and set off on a 1,600 kilometres (1,000 mi) journey along south, the Eastern Cape. This journey took her three years, between November 1928 and March 1931. In ancient times hippos were found in many areas around the world such as Europe, India and even the Nile delta. Nowadays hippos are only found in the sub-Saharan Africa. Guaranteed to be a family favorite! The Elephant and the Sheep. 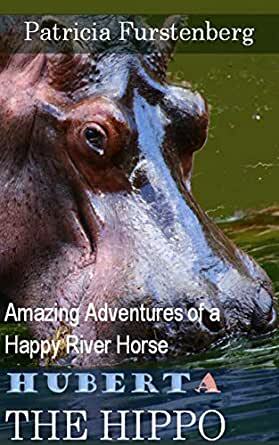 "Huberta the Hippo: Amazing Adventures of a Happy River Horse (Africa's Bravest Creatures Book 1) by Patricia Furstenberg is a charming tale about one of South Africa’s iconic animals, a hippo from Zululand. During a three-year period in the 1930s, Huberta (originally thought male and nicknamed Hubert by the press) roamed more than a thousand miles along the African coast. In the process, she became a celebrity and a symbol of hope during times of economic depression, attracting crowds wherever she went. Many wondered what caused a hippo to travel so far from its home. Furstenberg explores the theme of curiosity about the world and following one’s dreams in terms readers can understand. Photographs of hippos in natural settings add to the reader’s enjoyment. Written in flowing and rhythmic free verse and loose rhyme, Huberta the Hippo paints a picture of a happy animal who enjoys the simple things in life. Though the story is short, I found it engaging on several levels. It made me curious to learn more about Huberta and her history as well as hippos in general. It also provides an opportunity for adult and young adult readers to think about the concepts of happiness, home, curiosity, exploration, adventure, and following one's dreams. I especially like the personality that Furstenberg attributes to Huberta. She loves the simple things in life. For example, Huberta turns down an invitation from the wife of the mayor of Durban to join her reading club for tea, preferring instead a swim in the river and a grassy dinner afterward to tea and cake. An entertaining read."